This time we decided to try something different. We maintained one master deck, which we called the Original Version. Other than a few minor edits, the deck was a record of how we presented at ICC. The second was a version with comments and call outs, which we called the Annotated Version. This version included slides that we’d removed for time and added several additional slides to enhance the download experience. More on this later. We uploaded two decks simultaneously and cross linked them for maximum discoverability. We coordinated the meta tags and descriptions as well. This was an educational experiment. Let me share some of my initial observations, based on a week of activity. Because Michelle has a rather large and constantly growing Twitter base (@ShellKillebrew) and a solid base of Slideshare followers (slideshare.net/MichelleKillebrew), her version of the deck trended immediately. Within the first few hours of the decks being live, Michelle’s version appeared on the Slideshare homepage as a trending deck. As Michelle was immediately over 300 views, my version of the deck hadn’t made it to even 100 views. 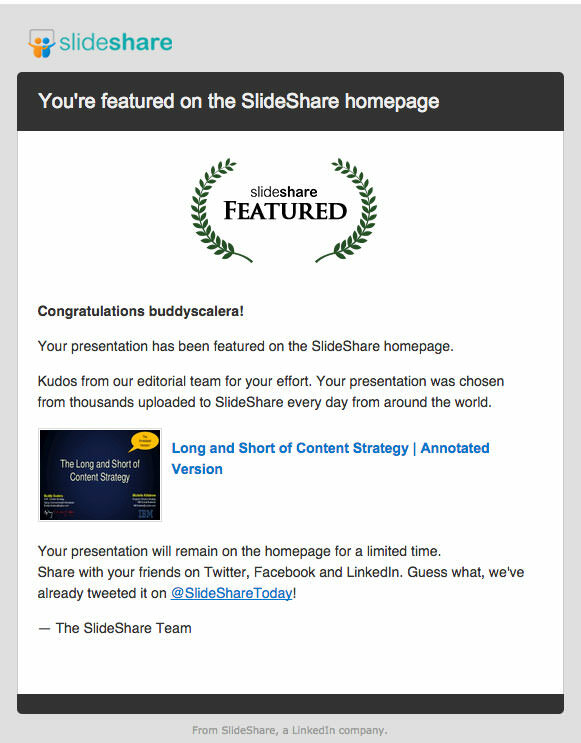 The next day, Slideshare featured the Annotated version of the deck on their homepage. Views skyrocketed, as did likes and downloads. They even gave me this nifty confirmation email. The Annotated version took off and surprised me. I expected that the views would have been about equal. The Original version had trended immediately, since Michelle has such a large social following. I suspect that the views would have been much closer, if Slideshare hadn’t featured the Annotated version on their homepage. In a presentation deck, you can’t always show every slide, nor do you want to. When you get on that stage, you are not just talking. You are performing. You need to distill the performance down to something that will both educate and entertain. That means removing a whole bunch o’ slides. The Annotated version allowed us to replace important slides, especially two positioning the concept of storytelling right in the beginning. We also added a few less-common slides, like a Credits page. Even though Michelle and I built the primary story, we had help from many contributors. This gave us the opportunity to acknowledge the other contributors, which we’ll do again in the future. It’s worth mentioning Ivan Ruiz, who works with me at Ogilvy CommonHealth Worldwide in Parsippany. He’s my go-to designer for visual storytelling. I treat him as a partner in my process and he contributed significantly to the way we unfolded our story. Here’s an infographic that he created about plotting a visual story. We added some tweets to the end of the deck, but they didn’t display well on Slideshare. The rendering is grainy, so the next time I include something like that, I’ll share the tweets as text. Slideshare handles text well, but compresses images. Overall, performance was better than expected. We’ve gathered some data that will help us formulate insights that we can use for brands we serve. 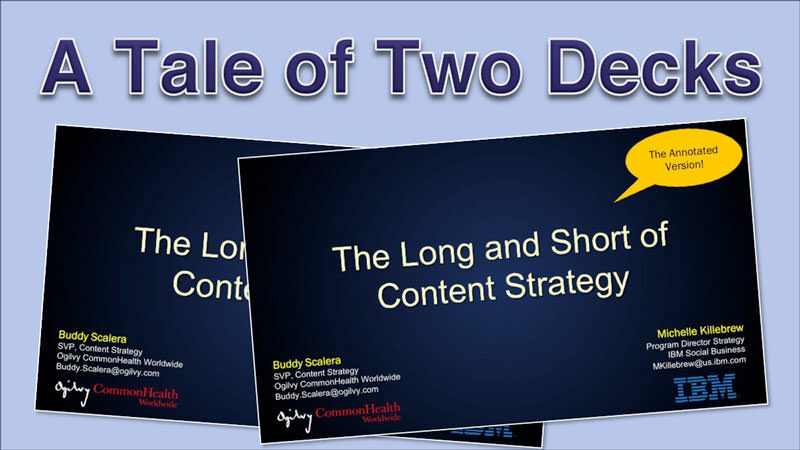 This entry was posted in Conferences, content, content strategy, Marketing, Powerpoint, presentations, Speaking, Story and tagged conferences, ICC, presentations, slideshare, storytelling by Buddy_Scalera. Bookmark the permalink.